We have a bone to pick. What's with all of this ham business going on at Thanksgiving dinner? Thanksgiving is supposed to be about squabbling about politics while Uncle Dave eats all of the stuffing. Then, Grandpa tells some story about rotary telephones that no one understands. But, most importantly, it's about that bird! You're supposed to be inspired with hope when you look at that golden turkey on the table, sitting right next to that weird horn-shaped centerpiece on the table that no one can really explain the meaning of. Lately, some, poor, misguided, and depraved families have been skipping on the turkey all together... in place of ham. Well, it's time to give turkey a boost in the war for Thanksgiving. It's time to show those ham families what the true meaning of the holiday is about! This adult roasted turkey hat shows off a golden bird in all of its glory. The soft hat fits comfortably on your noggin and it's sculpted to look like a cooked turkey. 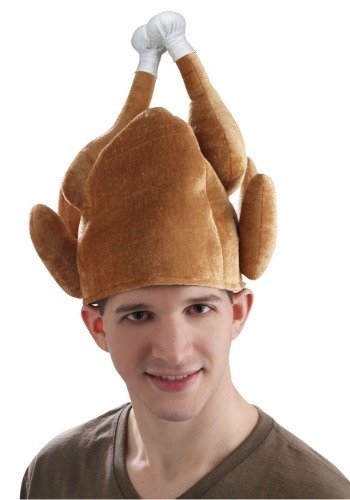 Just place it on your head and the whole world will know where you stand on the turkey vs. ham debate! Whether you just want to bring a dash of fun into your Thanksgiving outfit, or you're one of those poor souls stuck in a "ham family" this roasted should make your point clear. Turkey is king.